Sunny Joe White was the original Program Director of legendary Boston radio station Kiss 108. The former Beautiful Music station in Medford known as WHIL-FM set the market on fire when it became a full-time disco station in 1979. Sunny was the connection to the stars. As disco died in the early 80’s, Sunny transformed Kiss 108 into a major Top 40 station which still holds national records for huge ratings. When the Kiss Concert started in the 80’s it was Sunny’s relationship with the promoters and record labels that enabled the Kiss Concert to become the preeminent radio station concert in America. Sunny’s on-air persona was on of the keys to the success of Kiss. Joesph W. “Sunny Joe” White was the voice and face of Kiss 108, from the station’s disco origins in the late 70’s to the transformation into one of the most popular and influential Top 40 stations in America. As Program Director from the 70’s until the 90’s he was responsible for hiring Hall of Fame Inductees Matt Siegel, Dale Dorman and JJ Wright, as well as long-time favorite Billy Costa. It was Sunny’s unique connection to the record labels, promotion reps and popular artists of the time that enabled Kiss to remain at or near the top of the ratings for years. Kiss 108 became one of the most influential and copied radio stations in America. Sunny originally hosted the morning show on Kiss, then moved to nights due to the popularity of the format and the draw of large evening audiences. White hired Matt Siegel from WBCN to replace him in morning drive. 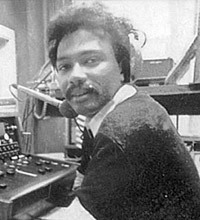 In 1991 Kiss 108 replaced Sunny Joe White with Steve Rivers from crosstown WZOU, and Sunny took over programming duties at WZOU until the station was purchased by Kiss 108 in 1993. Sunny subsequently was on-air at WVBF. He died of heart failure in 1996 at the age of 42.